Many of us have been there. Wanting to pinch ourselves when the right person finally shows up. For once, things are as they appear, good! You have had absolutely no drama, no red flags, no “something just isn’t right” moments. None of that; yet, you begin to allow negative thoughts to sabotage your “good thing”. You start to allow the voice of doubt and distrust to become loud and overpowering. 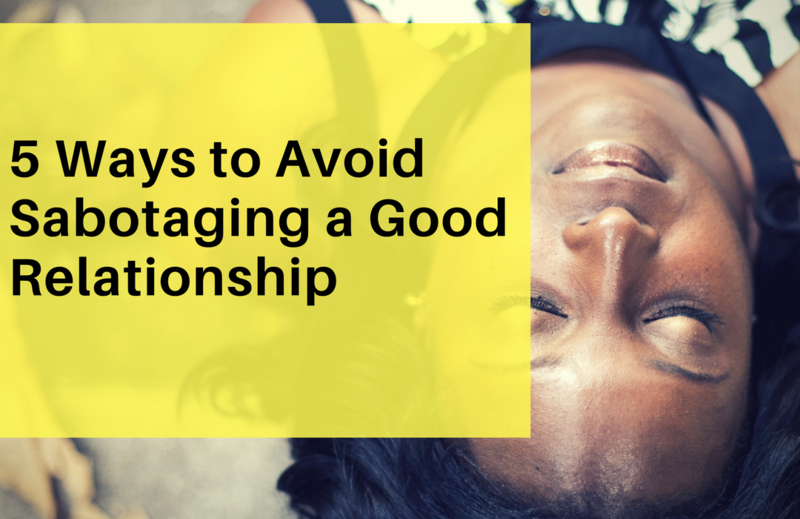 Just chill for a moment, and consider these 5 ways to avoid sabotaging a good relationship. Blank Canvas. Give them one. Don’t present yourself with a canvas full of paint, (past hurts and disappointments). They didn’t cause either, so they should not be made to pay for screw-ups of your past relationships. Guilt. Feeling as if you don’t deserve to be happy. If you have done some shady stuff in the past, it was just that…your past. Forgive yourself and embrace the “happy”. Resist the urge to keep replaying your past mistakes over and over and over again, in your mind. Have some confidence in your ability to maintain a healthy relationship! Others. Are you making mental notes of your relationship milestones, then comparing them against other relationships? Every relationship is different. Doing this creates unnecessary added pressure for all parties involved! You are not their ex, so why are you wondering why it didn’t work out and badgering them for details? When they are comfortable with you, they will share that information with you. Self-comparisons are the worst and one of the quickest ways to send a relationship into “crash and burn mode”. Throw way the mental red flag checklist. Embrace the newness and joy that the person brings. Believe it or not, we can do some of these same negative things in other areas of our lives where good things are happening. I encourage you to resist the urge of doing so. Embrace and welcome the good without self-sabotage! You deserve the good, so why run from it?